The third sonnet is nearly ready to be recited. That sounds cheesy, doesn't it? But it's the best I could do. Back to school and crazy deadlines and the adjustment of having the man now working at home have combined to completely fry my brain. Completely. Fortunately, it hasn't affected my knitting! The knitting is nearly done and the pattern is in the tech editor's capable hands. And the yarn... swoon... the yarn. I want to marry this yarn and have it's little mini-skein babies. This base is just like butter. I took this project to knit-night last Friday and my friend Kristin spent a good deal of the night just petting and cuddling the yarn. I think the yarn was okay with that. I mean it is called Pillow Talk yarn, so it's kind of just begging to be touched! 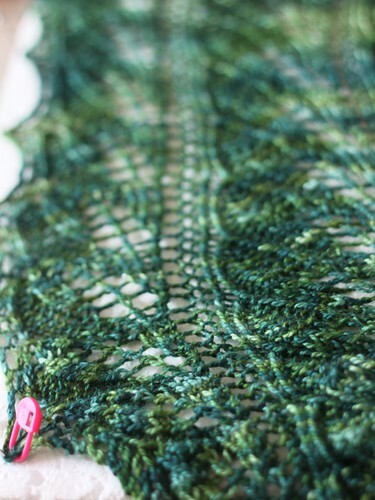 Turtlepurl has this scrumptious MCN base and she has such an eye for color. The colorway is "We Were Looking For Leafy" and the gorgeous twisted stitch leaf motifs in this design make the most of it. Just wait til you see - September 1st is the day!